Tejal Naik, a junior in the College of Arts and Sciences, with his poster. Guests from the University community, the Howard Hughes Medical Institute and several scientifically oriented industries from across the tri-state area thronged the corridors of McKinly Laboratory on Aug. 13 to hear and see oral and poster presentations by the 123 students participating in this year's Summer Undergraduate Research Symposium at UD. The symposium, now in its eighth year, gives undergraduates who've spent the summer pursuing independent research projects in the sciences, mathematics and engineering a chance to hone their presentation skills and showcase their work. The half-day exhibition at McKinly Laboratory was just part of the three-day campuswide event that concluded 10-weeks of summer research and spotlighted the work of participants from UD and included students from Delaware Technical and Community College, Wesley College and Lincoln University. “A big part of this symposium is to give students a chance to present their work and get used to having it critiqued,” said Harold White, professor of chemistry and biochemistry and director of UD's Howard Hughes Medical Institute Undergraduate Science Education Program, who, along with David Usher, associate professor of biological sciences, initially developed the oral presentation and poster session as a way to help students enhance their communication skills and prepare for national competitions. “Our students did tremendously well this year at the American Society for Biochemistry and Molecular Biology competition,” White said. “UD students got six out of 16 honorable mentions and took first place in three out of the four categories in the poster competition. I think the reason our students do so well at these events is not necessarily because they do better work, but because they have had plenty of opportunities to learn how to communicate the scientific concepts of their research. White said this year's speaker, Louis J. Guillette Jr., Howard Hughes Medical Institute Distinguished Professor of Zoology at the University of Florida, Gainesville, also was a welcome guest at the event. 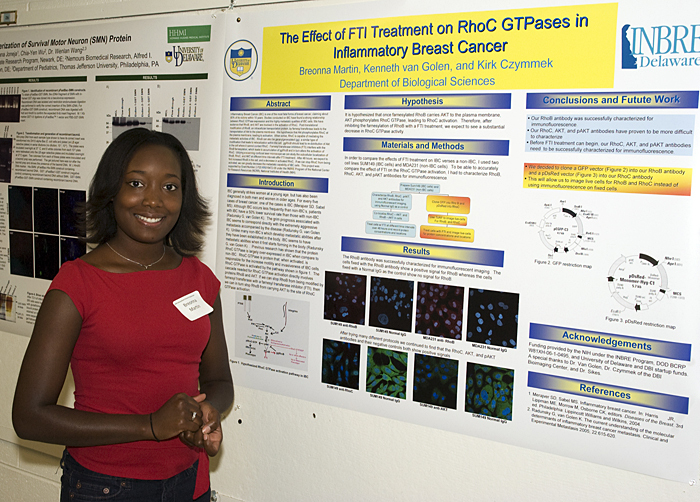 Breonna Martin, a senior in the College of Arts and Sciences, with a poster about her research. White said Guillette, an internationally respected zoologist, was both entertaining and knowledgeable and his opening lecture, “Lessons from Wildlife: New Approaches to Understanding Environmental Contaminants and Health,” focused on new research targeting the effects of contaminants on the reproductive and developmental biology of alligators and humans. 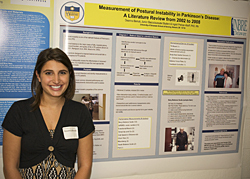 Among the undergraduate students involved in the symposium, Liana Sherrod, a junior biological sciences major from Wilmington, Del., spent most of the summer working in the lab with her adviser, Mary Ann McLane, associate professor of medical technology at UD, in an ongoing project studying the use of eristostatin, a disintegrin found in viper venom, in inhibiting the metastasis of melanoma cells. Sherrod, who plans to pursue a doctoral degree in biological sciences after graduation from UD, said that her independent research entailed tracking what integrins in the cancer cells interacted with eristostatin. “My experiment is to figure out the mechanism involved in the prevention of lung cancer colonization by melanoma cells,” she said. 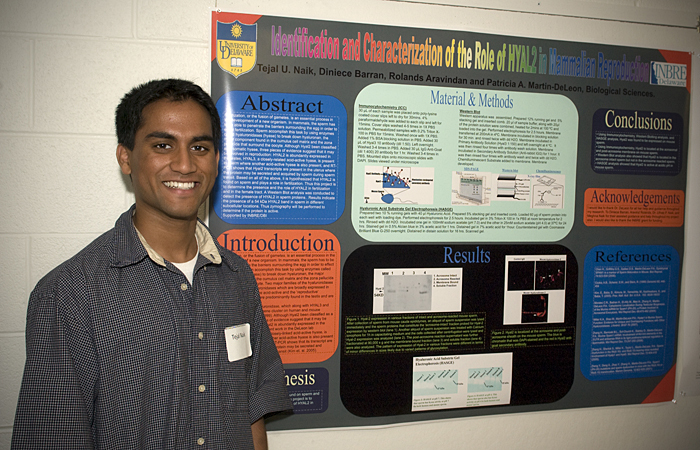 Tejal Naik, a junior biological sciences major from Hockessin, Del., who plans to go to medical school after graduation from UD, said that his research on the protein HYAL2 might eventually lead to new discoveries in cancer and infertility treatments, as well as male contraceptives. Adrian Pearson, a senior in the College of Arts and Sciences, explains his research. Rachael Greenberg, from Slingerlands, N.Y., and Lauren Pulinka, from Middletown, Del., both junior psychology majors, worked as a team to conduct their research on predicting the stability and longevity of marriage for 120 newlywed couples. Their research drew on existing findings, which focused mostly on the negative outcome of divorce, but Greenberg and Pulinka took a positive angle and focused on teasing out marriage satisfaction. 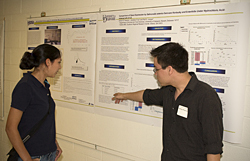 The Summer Undergraduate Research Symposium is co-sponsored by the Howard Hughes Medical Institute's Undergraduate Science Education Program, the Delaware Biotechnology Institute, the Department of Biological Sciences, the University of Delaware Chapter of Sigma Xi and the College of Arts and Sciences. 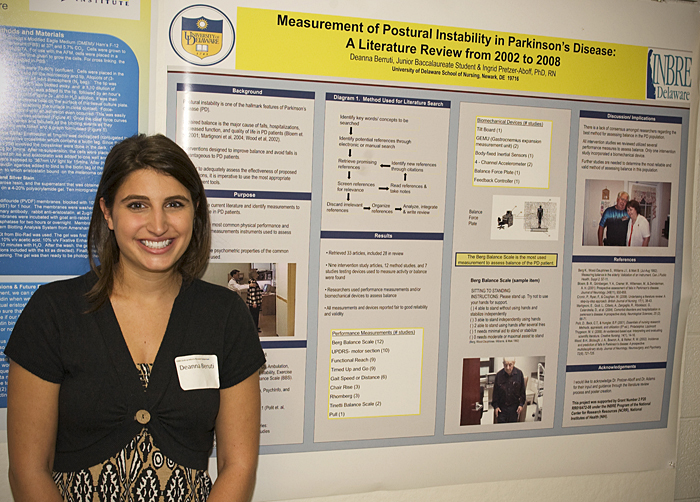 Deanna Berruti, a junior in the College of Health Sciences, with her poster. 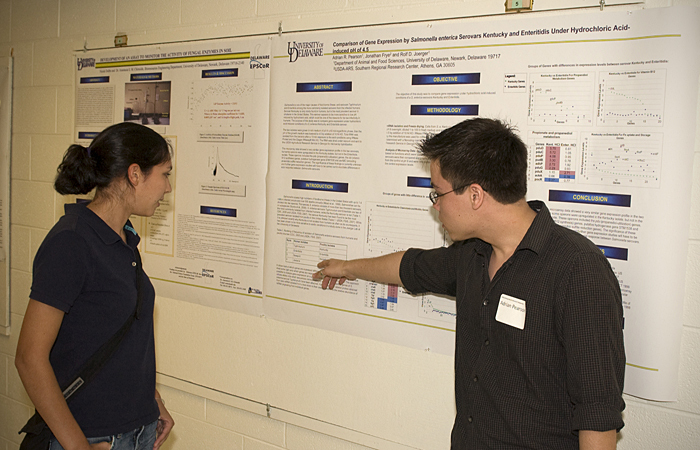 Participating students were supported by the Howard Hughes Medical Institute Undergraduate Science Education Program, UD's Undergraduate Research Program, the College of Agriculture and Natural Resources, the National Institutes of Health Delaware IDeA Network of Biomedical Research Excellence (NIH INBRE) Program, the National Institutes of Health Bridges Program, the Beckman Scholars Program, the Ronald McNair Scholars Program, Charles Peter White Fellowships, the National Science Foundation Experimental Program to Stimulate Competitive Research (NSF EPSCoR) and a newly launched prostate cancer research project funded by the U.S. Department of Defense.